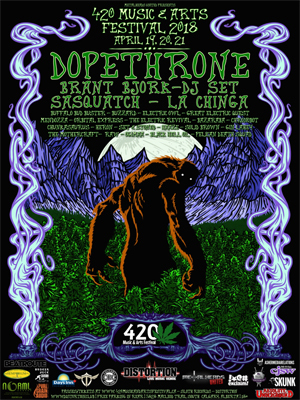 Calgary, AB's 420 Music & Arts Festival presented by METALHEADS UNITED announces their 2018 line-up for April 19th, 20th, and 21st featuring headliners DOPETHRONE, BRANT BJORK (KYUSS, VISTA CHINO) (special guest DJ set on 420), SASQUATCH and LA CHINGA along with over 20 other acts ranging from stoner rock/stoner metal, doom, psychedelic and heavy blues. All ticket sales are final. No refunds will be issued unless full festival cancellation. 420 Music & Arts Festival reserve the right to change the line up as required due to band scheduling and/or other circumstances beyond their control.